Great creatures, but I must say that they're not as good as your previous creatures. 1. Sperk: A small omnivorous creature that seems to have the bare minimum of everything; one eye, one ear, one feather and one pair of legs. It makes up the bottom of the food chain and is the number one consumed organism on Omni Vita 3, good thing too since it's estimated that 500 sperks hatch every half hour. 2. Hoshern: A medium sized herbivore that packs quite a punch. The hoshern is a herding creature and is qutie good at defending itself with its large array of spikes atop its head. 3. Gulbar: The most unevolved piece of slime to ever make it past the 5 minute mark in all of evolution's history. The Gulbar has remained in the same basic form ever since it crawled forth from the primordial ooze 2.8 billion years ago and somehow it hasn't died off yet. Its continued existence is most likely due to its main source of food, the massively reproductive sperk. 4. Shornador: On of the most intelligent creatures of Omni Vita 3, shornadors are very social creatures and eat mostly leaves and the occasional aquatic creature or pathetic gulbar. They have the most advanced eyes and can see really really far away which is what keeps them from being easy prey, well that and the giant spiked tail and talons. 5. 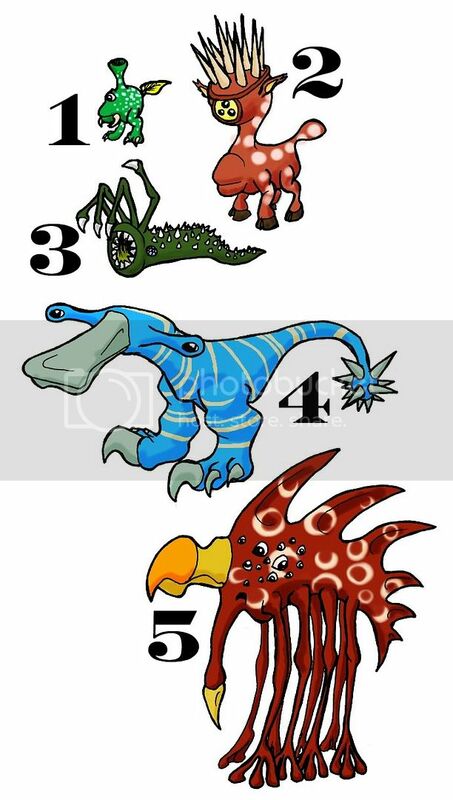 Flobbaron: As opposed to shornadors, the flobbaron is probably one of the dumbest creatures of Omni Vita 3. It may have more eyes than the shornador but it hasn't quite figured out how to focus them all on the same thing yet, making it very flighty, fidgety and prone to fits of ADD. Though it may be pretty dense it is one of the big hunters due to its astronomical running speed and the super sharp talon hanging from under its mouth. Hopefully these are better than the last batch. yah p-luke you were right, the last batch wasn't quite to up to par. What do you guys think? Fantastic Creatures, I love the Flobbaron! sweet! i want a pet shornador! and a sperk! and a gulbar! Staring at more then one thing when something can is usually a good idea. I like 4 but 5 is just so crazy! Too many legs! The Hoshern is cool: Bambi gone mutant! Hey thanks for all the comments guys! Glad you liked em, now for a slightly less exciting update: foliage! 1 Ulbaw Tree: Dominating most of the forests this tree is anchored in place by a bulb-like underground structure as large as the bulbous end above ground. It goes through a 2-part cycle; in the first it gathers massive amounts of nutrients into it's upper bulb for up to 4 years and then has 1 year of constant blooming where it's small green buds burst open and send seeds flying so fast they've blinded more than a few helpess sperks. 2 Swyral Flower: A rare flower that lives only to bloom once before it releases it's seeds, the swyral flower is one of the favorite snacks for lucky herds of hoshern. 3 Bolular Tree: Found only in the tropic regions the bolular tree blooms in much the same way as the swyral flower but will bloom multiple times. The large hollow areas are often home to small critters who in return, fight off other creatures who would harm the bolular tree. 4 Sperkberry Plant: The sperkberry plant's lot in life is to feed the mass population of sperks, and the sperks love the berries. The seeds inside do not get digested though, the sperks usually excrete them with a nice amount of fertilizer, spreading the sperkberry plants wherever they go. 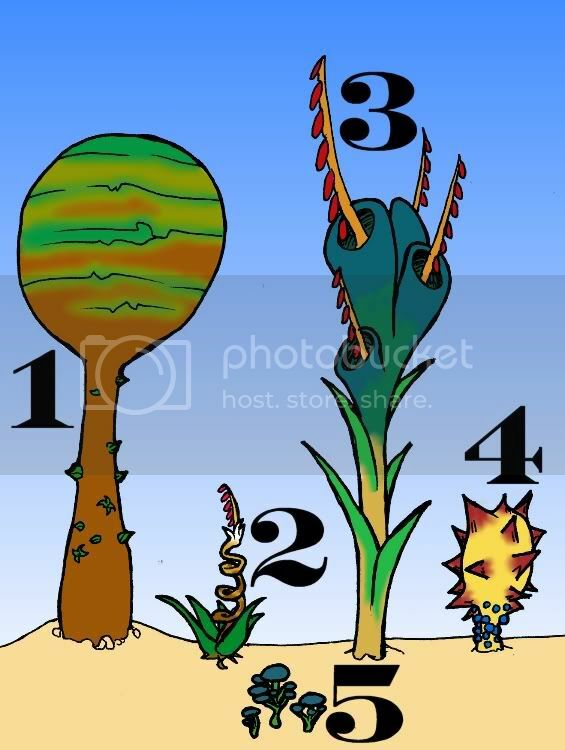 The plant has evolved the spikes to prevent animals like the hoshern from eating the berries and digesting the seeds within. 5 Flagreaf: The most common plant on Omni Vita 3, it is found all across the landscape in a variety of subspecies. The plant usually never grows above one foot tall and is great at absorbing sun beams through it's flat, horizontal and circular leaves. It's the main food source of most of the grazing animals. Very pretty Especially number 3, reminds me of what I would want on my own planets. Cool drawing man, really nice...wow. No, the exploding bulb idea is still yours. If you reread the description it says that the small green buds(the little specks on the trunk of the ulbaw tree) are what pop open to send seeds flying.